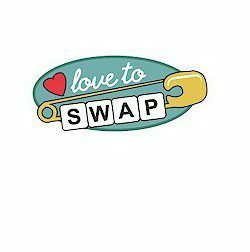 15 reviews for "Love to SWAP* Patch"
Everyone loves the patach. Even with paying for shipping it was cheaper than getting the patch from a counsil shop. Keep up the great work. I am definately spreading the word about this website to all my fellow Troop Leaders! Very pretty on the green Jr. Vest. Love it! High quality as well. When we received the patches,everyone loved them. The quality was great. We will be ordering again from you. The proce is better than what any scout council can offer and the quality is better. Nice size also!!!!! 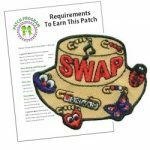 Cute patches delivered quickly and were a big hit at our SWAPS workshop. I loved the Swapper patches the only problem is that it is quite large to be putting on a bucket hat. I just love this patch. The detail is amazing . What a great reminder of the fun of SWAPIng. I will be ordering more for friends. Very nice patch. Girls liked it. Nice size and nice stiching. Colors could adjusted to be more suitable for girls. We will be restocking. Hopefully get them this month. I love this patch-you guys make the cutest swap patches!